Whether your needs be a strategic public relations plan, a media training, or assistance in handling the press around a crisis situation, Ruppe PR is equipped and ready to deliver. A wealth of knowledge, years of experience, deep relationships with the press throughout the nation – all benefit your needs. Click through the list of services below to learn more. When something bad happens expert public relations advice makes all the difference. When the building is on fire the media wants answers. Knowing when, how and what to answer is essential to your survival. It’s the difference between weathering the storm or suffering irretrievable damage. The stakes are far too high to go it alone when your reputation is at risk. A lack of response or a poor response can significantly impact and damage an organization. RuppePR has decades of experience in assessing every type of crisis situation and building successful responses – effectively protecting an organization’s reputation. Steve Ruppe spent many years learning crisis planning and response for the chemical plants and oil refineries of South Texas and Louisiana. His practical advice and strategic plans have been critical for organizations to handle issues from simple mistakes in fundraising materials to wrong-doing and misspeaks by executives. Rescue Missions, Food Banks, churches and para church organizations have relied on him to lead them through many complicated minefield situations. Carefully crafted and painstakingly prepared crisis plans are essential. Procedures in place to prevent mistakes and miscues in the critical first moments of a crisis, followed by logical steps for survival. Any crisis must be followed by rehabilitation and restoration of your organization’s good name. Before a crisis occurs, RuppePR has all the expertise you need to put a workable crisis plan together for your organization. Brand Promise: An organization’s name is its brand. A name is how the public knows and identifies you. But a brand name is not the whole story. The rest of the story is establishing what the name actually stands for. Brand Recognition goes hand-in-hand with success. People have to know you to love you. Being the best-kept secret in town isn’t a good place for an organization to be. Becoming well known to the public in a positive way is the result of building public support through recognizable, laudable activities. Good work garners good press. Getting your name, your logo and the reason for your existence out there clarifies your image in the public mind. It comes from the strategic use of free media, social media, marketing, public relations and community relations. Consistency of message is crucial. All aspects of what you communicate should positively reinforce and spread your brand name and logo identification. The heart of any good public relations plan is consistent innovation. Developing the creative means and the specific methods to raise the profile of an organization in the community – reaching out effectively to everyone who may want to interface with your organization. Event planning for maximum media exposure. What is worse than giving a party and no one comes? Having a major event and not getting any media coverage? That could be the worst. Many in the media look at banquets and other events as not newsworthy, but well-organized and savvy organizations can work in advance to make their events something media will cover – and cover extensively. The planning starts with date selection, and goes through carefully examining every detail of the event with an eye toward making it media friendly, newsworthy and visually appealing. RuppePR has worked events large and small. We were principle planners and on-the-ground supervisors of two large events on the Mall in Washington, DC – Promise Keeper’s “Stand in the Gap” and “The Call” DC. RuppePR has organized and handled every kind of special event, news conference, holiday event, fund-raising banquet and career fair of every size, dimension and complexity. As a result, SRPR is uniquely qualified to help you make the most of your event challenges and opportunities. Key Message Development Key messages are those subjects and phrases that tell the story of an organization. There are two types, enduring key messages and situational key messages. Enduring key messages include the facts about the organization that don’t change over time, such as its name, or the year it was founded. Situational key messages are based on an individual story opportunity, event or incident. The process for developing key messages is nearly as important as the messages themselves. RuppePR can provide assistance in developing the process, as well as identifying and refining the primary key messages of an organization. The process of key message development is crucial during an emergency or crisis situation, and is best established prior to a potentially negative situation. Many organizations are told by supporters that they are “the best kept secret” in the community. While that sounds like a complement, it actually is anything but. When you aren’t telling your story – engaging the community, your fundraising, volunteer development and relationship opportunities are crushed. The simple fact is that most organizations fail to reach out to the media when they have something to tell the community, or their efforts are ineffective. The media can be a big megaphone, an easy method to reach thousands at once rather than one at a time. Many organizations just don’t know the answers to the basic questions: When to call the media? Who to call? What to say? And most importantly, how do I make sure my story is something they will want to cover? Building good relationships with reporters, editors and other media representatives requires good tactics. The organization needs a comprehensive and current media list. The times to call newsrooms and the right people to call. Coming from more than 2 decades working in all aspects of the media – as reporters, editors and executives, RuppePR can not only demystify what needs to be done – but can offer insights and tools to do the job well. We have the hands-on experience in getting organizations both large and small positive media coverage. We can do the media relations job for you, or help build your staff’s capacity and effectiveness at getting the right attention. Want to find out how to get more coverage and better coverage? Give us a call. Media training is essential in assisting organization spokespersons make the most of opportunities on radio, television, newspapers and other media. Learning the proper techniques and then practicing in a safe environment allows those who face the cameras to build skill and confidence. Ruppe’s media training expertise was honed in the petrochemical business corridor of south Texas and Louisiana. Over the last 25 years, RuppePR has helped thousands of corporate executives and nonprofit leaders learn the art and practice the skills of preparing for and conducting media interviews. RuppePR media training classes challenge participants. They experience a lively blend of relevant real-world scenarios and on-camera practice to build confidence and refine techniques for successfully handling media interviews. Participants invariably report they feel more control, more confidence and much-improved outcomes in media interviews. Day-long media training sessions are available at an organization’s location so even those who aren’t media spokespersons can learn the important lessons provided. Media will become more aggressive if they believe that someone is stonewalling them, so training sessions also provide tools for first responders to respond in a neutral manner while spokespersons are on their way. Often nonprofit organizations find themselves needing public relations assistance, but not having the available funding to hire experienced, professional staff or an outside agency. RuppePR can assist by mentoring less-experience staff with highly professional public relations services. Teaching, encouraging and equipping learning PR professionals has been part of what we do for years. We can support them with idea generation, refining stories, preparing for media outreach, editing of written materials, adding the professional touch to all projects. The goal: to help them grow and progress to the point of needing less and less help. The amount of mentoring needed depends on a number of factors, so there is no cookie-cutter approach. The process is specific to each organization and their staff persons. But the bottom line is: we can help without breaking the bank. Your pulse is racing. Your mouth is dry. Your palms are sweaty. Your thoughts are jumbled. Your face feels flush. Your breathing is shallow. Your stomach is churning. The flu? No, some of the symptoms regularly felt by many when speaking in front of an audience. Most organizations need people who can stand up in front of a few to a few hundred people and explain what it does, why it does it, and how effective it is at doing it. Not many really like the public speaking role – but many learn to put aside the fears and trepidations and do the job – and do it well. There are techniques, practical applications and other tips to help presenters become more comfortable in front of groups of any size. RuppePR has been helping hone effective speaking skills for many years. Junior staff members to top executives have benefitted from seminars, classes and one-on-one instruction. Often bolstered by video practice sessions, significant improvement can be achieved in just one session. In several instances, entire organization presentation staff has benefited from an-all day training session. Don’t be beset by worries and nervous response when it is time to make a presentation – Let RuppePR help take the fear out of public speaking. Facebook, Twitter, Instagram, Snapchat, Pintrest, YouTube, Linked-in, and more coming every day. Social media is more than what teenagers do (sometimes 12 hours a day), but can be a useful tool to communicate with those who support an organization. Audiences can be very loyal. Social media is one of the tools of public relations. Like media relations, there are different platforms serving diverse audiences. It is not enough to just post occasionally, if social media is going to be effective it requires strategies, posting calendars, constant monitoring and full-time effort. RuppePR and its partners have been successfully helping organizations with social media for years. Let us help build an integrated social media policy that will assure your organization is visible and active with this growing outreach tool. Stories tell how and why an organization does what it does, and personalizes the solutions and successes it has. Finding, confirming and refining the story becomes the issue many organizations face. A deliberate and consistent process is necessary to identify and evaluate stories for accuracy. RuppePR has former news reporters and editors on staff, and can work with organizations to help set up processes to find and verify stories, and then help those involved tell their story in a compelling manner. In journalism, “the little story tells the big story.” A great personal story featuring someone whose life was changed by an organization’s work can help the public understand how the organization solves problems and makes a difference. Hard facts and statistics are vital to showing success, but well-told stories can make the information memorable. Organizations without a public relations department can solve that problem immediately. RuppePR can become your PR department. We can provide full-service strategic and tactical public relations, everything from planning to execution of daily activities. We can transparently represent an organization, so that media interacts with the primary spokesperson – but we do the preparation work, writing the materials, doing the distributions – even taking phone calls. An organization can instantly have full-service public relations – and not waste time on training staff and getting the services necessary to do the work. RuppePR has successfully preformed this responsibility for several organizations – call us if you would like to interview our clients. We can work with your organization to assess the situation, put together a plan, a calendar, a process and a budget – and get the media to pay attention. What do reporters and editors want and need from an organization sending media releases or advisories? What are the essential elements that need to be included? What drives editors crazy? What makes them take notice? Can your organization write materials that the media will use? 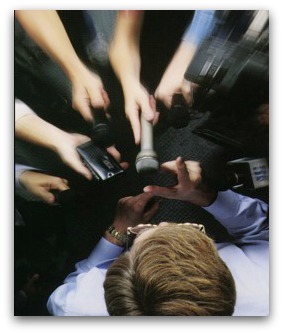 Everyone pretty much knows that media wants the 5 W’s – who, what, when, where and why for a news story. But, that is just the start of a news release or media advisory. Sometimes editors respond to a simple email telling them something is going on – such as a cold-weather response by a homeless shelter. Sometimes a well-explained schedule of planned events can entice a news editor to cover a holiday event. Frequently a well-written media or press release can find its way into a publication or on a website simply because it is written in the right style, and short-handed media need the content. Op-Eds and letters to the editor can tell your story in your words. But they can’t be belabored or self-serving – and they have to be pithy, to-the-point, and about something important. RuppePR has helped organizations all over the country craft successfully-placed Op-Eds and letters to the editor. Our media advisories and releases have resulted in hundreds of stories seen, heard or read by millions of people. A combination of journalism careers and public relations experience gives us the wherewithal to bring the media to your door. We can write content based on materials an organization provides, collect the information and craft materials from that, or take what has been written already and edit it to the highest professional standards.